Down the Nam Song River in Vangvieng, Laos on inner tubes can be really extreme in this small town at 160 km north of Vientiane. Vangvieng was used as an airstrip by Air America during the Vietnam War. The city has not been forgotten. In the 80’s, backpackers looking for a place to retire and to enjoy life and illicit drugs from the Golden Triangle began to make base in Laos. Vangvieng is now full of guesthouses, bars, hotels, restaurants, internet cafes and travel agencies, to the delight of some and the misfortune of others. It focuses on tourists in shorts, everyone turns a blind eye as long as it is their small tip. A kind of cheap “Khao San Road”, we found dozens of bars showing episodes of Friends and Family Guy in loop. 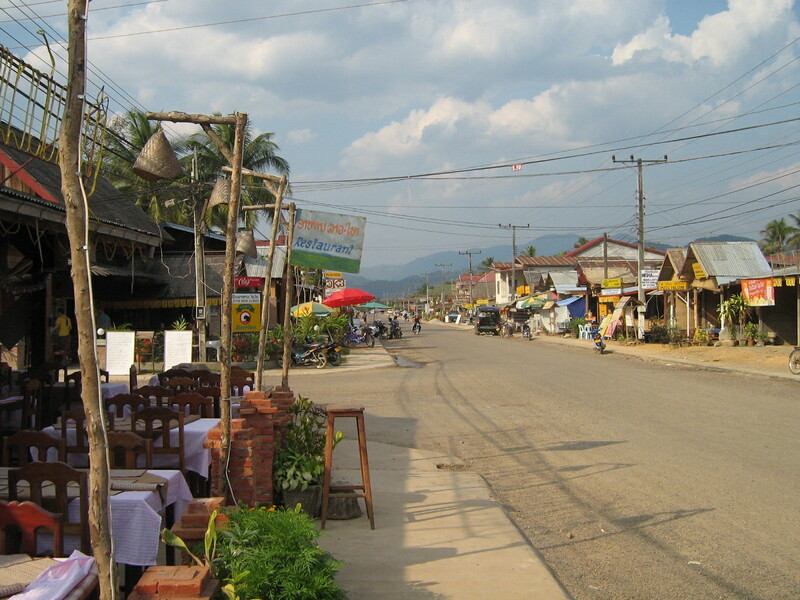 The traditional Rayban sunglasses for $ 5 and t-shirts with the saying “same same but different”, and Beerlao and Tubing in Vangvieng are widely available. This mountainous region with beautiful red sandstone cliffs are riddled with caves and waterfalls. But the principal attraction is the tubing or drugs and booze. Needless to say that Vangvieng in the book of many young travellers is a wild party not to be missed in South-east Asia. The tubing is simple. You rent a tube in town for about 14USD including a $74 deposit and you will be transported by a tuk tuk to the tour departure point located three kilometers further down the river. A short walk to the river also leads us to the first bar of a long series. From there, we take our first beer or “bucket” and we begin to float in every sense of the term. During the day, hundreds of young dress in bikinis and Hawaiian flowered shirts dance and move like in a dusty bamboo trendy bar in Ibiza. The scene is embarrassing for a lonely white traveller who has come to share the local culture with the locals. There are several high built in places to jump into the river along the route. Alternative to tubing in Vangvieng, you can also rent kayaks or the services of a boat to enjoy the scenery and take pictures without much effort. Find out about the many other activities available in offices and tourist agencies in town. Each year, several young travellers die in Vangvieng for a different reason, but the main reason is to be drunk as hell or stoned on any substances and jumping and swing from doubtful bamboo infrastructures. We must be careful when we jump from 10 meters under the influence of the whiskey or several Beerlao under the sun. Drink moderately or at least not more than you do at home. If you get drunk, it is better to remain calm and not swim or jump. This is really not the time to test an unknown drug and avoid Lao whiskey. It is not expensive, but it is very toxic. Worth to see this circus of lost youth, but it’s sad that this beautiful natural site is tarnished by this tourism industry on an uncontrolled skid. The morning in the town you can see the young, red faces and their brain clinically dead walking like zombies. Once the dusk is down they return to the vibrancy and color. They began their visit to the bars where the local serve them a mountain of drink and watch them barf on the road, singing football songs and sometimes fight with each other. There are good quantities of cheap drugs available, in the past the restaurants called them “happy pizza or space menu.” Now it seems that some government pressure has pushed traffic from inside to the outside of restaurants. Consume nothing at the sight of all and especially not in the street. We have never sees anyone being arrested, but we have heard lot of nightmarish stories. Go farther into the jungle in your bamboo hut on the other side of the bridge over the Nam Song or even better consume nothing. That is even safer. In fact, everything is fun, the party is cool, but it’s not a reason to forget that we are not at home. There are no written rules on signs across the street. Here they believe in Buddha and individual responsibility. Forget the safety standards and international law. Prisons are not Spanish inns with cozy sofas and cable channels. Each year dozens of deaths are reported to the foreign authorities often in a weird circumstance with little response and clarification. For example Alexander Lee had a holiday in Vangvieng Laos that ended in tragedy, the police found the young Australian aged of 22 died with a Dutch teenager on his side. Lao authorities said the body of the young man and young woman, Rianne Brouwer 18 years old was surrounded by prescribed medication and bottles of beer. Official statements say that the two youths had taken a room in a guesthouse in Muang Ngoi District. They have not been seen in the hotel before employees discover their body several days later. Things keep getting worse, the illegal drug trade is booming in Vangvieng, several deaths related to drug use involving foreigners are often reported as some local residents confirm. The drug remains easily available even after the authorities have closed several establishments such as bars and restaurants suspected of being involved in drug trafficking. The problem also affects local young drug addicts who commit theft and mischief. The crime rate increases dangerously causing lot of collateral damage. The source comes from the Laos border shared with Burma, Thailand and China which form the Golden Triangle; a lawless territory controlled by ethnic armies, the lords of opium and the powerful drug cartels. The increase in drug is trafficking and smuggling to other countries like Thailand makes it difficult to prevent drug abuse among young people of Laos. The UN Office on Drugs and Crime (UNODC) reports that the country faces an alarming increase in methamphetamine trafficking and the use of highly addictive drugs. The problem is especially serious because if counterfeit electronic products can be found there are also counterfeit drugs. If buyers are lucky, they will receive sugar in their counterfeit drugs, but it is reported in several cases that rat poison and extremely dangerous toxic mixture are found instead. Do not play Russian roulette with illicit drugs. I suggest you try tubing in Vangvieng, Laos at least once in your life however do not try to beat the record, they have all been beaten. It is up to you to decide whether you want to participate or avoid this perpetual spring break for backpackers.